It’s been a long time and I’ve been itching to write on a more regular basis. So what better to talk about than one of my favorite events of the year: Microsoft TechEd. TechEd is Microsoft’s premier educational conference for IT pros and Developers. 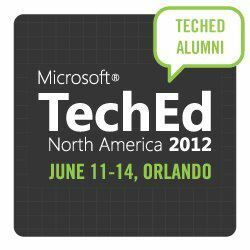 This year, TechEd will be held on June 10-13th in Orlando, FL. 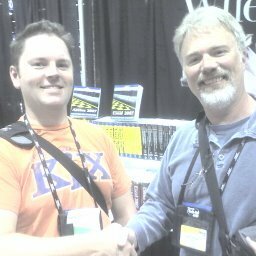 Since things with The Krewe (more on that later) and TechEd are picking up, I thought it would be a good time to revisit TechEd years gone by and why TechEd is a huge priority for me. First a little background, I’m a technical instructor at a technical college in Madison, WI. My background is Windows infrastructure with a recent addition of VMware virtualization. I teach all of our Windows Server classes. I’ve also written a college textbook on Windows Server 2008, or W2kOcho. As a teacher and an author AND a technology geek, keeping up-to-date is imperative and a full time job at times. So my first TechEd was 2007 in Orlando. It wasn’t my first conference, but it was the largest one I had ever been to. I didn’t know anyone at the show but ended up running into a group called The Krewe who have grown into my extended family, but more on that later. So I went to sessions, talked with vendors and reps from Microsoft, and hung out with other geeks day and night. It was awesome! And when it was over, I couldn’t wait for the next year. Why? To hang out with the friends I’d met and learn about the newest Microsoft technologies from the Experts. The next year, 2008, gave us the releases of Window Server 2008 and Windows Vista. There was so much great information on both products that it was hard to choose where to start, but I focused on Server as that was where my passion and most of my class work was. Lucky for me, I was able to work with the Server 2008 beta. With that skill and my connections & info from TechEd, I was able to get a contract to write a college textbook on Windows Server 2008. I tell you definitively that would not have happened without TechEd….hands down no brainer! Fast forward to the Summer of 2011. A good friend and fellow Krewe member, Brian Bell, reached out to me and asked me to assist his company. This assistance came with a huge benefit. It allowed me to join Brian as a member of the Windows Server vNext Technology Adoption Program (TAP). After 4 days of super-secret training on the next version of Windows, I realized how lucky I was to get hands-on access to Microsoft’s next OS. And this was only made possible through TechEd…Because Brian and I met through The Krewe at TechEd. Over the years, I’ve met hundreds of people through TechEd, many of which I keep in touch with on a regular basis and whom make up the “Ultimate Geek Rolodex”. I am with a single tweet or email of some of the smartest, brightest and coolest IT Geeks on the planet. While the product information is top notch, the networking connections I’ve made are invaluable and irreplaceable. So I can’t wait to get back to Orlando, meet up with The Krewe, get my learn on, and fly my Geek Flag!